Skil Emission Monitors are designed to measure dust and smoke discharged from Furnaces, Incinerators, Boilers and industrial plant. Satisfying legal requirements to monitor smoke and particulate emissions into the atmosphere. 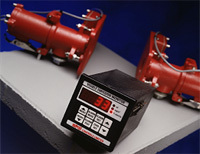 The Model 252 Visible Emission Monitor may be used to continually monitor and display optical density or opacity, and will also display particulate emissions when calibrated on the ISO-kinetic sampling principle as described in BS893 and BS3405.The equipment comprises a digital indicator control unit suitable for panel mounting, transmitter and receiver units, complete with extension tubes for mounting to the flue or stack. The Monitor can also be used to measure other opaque fluids, such as fume within tunnels, vapour, fog and dust discharged from extractors and machinery.